The cure for this is my steel-cut oatmeal. Not only does it take very little hands-on time on my part, especially if I have the dry ingredients mixed and at the ready in advance, but it makes fantastic leftovers. Of course, this photo might have you asking the inevitable question: how? 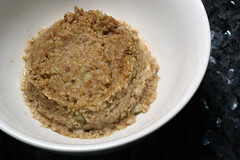 This is what the oatmeal looks like after sitting in the pan while Chris and I ate as much as we could. Actually, it looks worse than this, because I stirred it up before I took the photo. Not only does it turn thick and gummy as it cools, but it forms a dry crust on top from evaporation. For this reason, it never even occurred to me to keep the leftover oatmeal. We’d make a single batch and stuff ourselves eating the whole thing. But then Trader Joe’s started selling frozen, precooked oatmeal. I bought it, tried it, and it was pretty good, though not as good as mine. Then it hit me: I could do that! 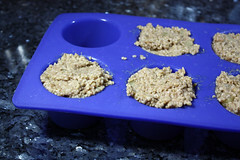 All you need is a silicone muffin pan. I just fill mine up, mounding each one little over the top if I can to make it a good serving size, and pop it in the freezer as-is. You can put it on a sheet pan for stability, but the flexible muffin pan with its grippy bottom actually does a good job of conforming to the shape of the food it’s set on. Once the “cupcakes” are frozen solid, you could pop them out and store them in a freezer bag, but I usually eat mine within the week I make it so I don’t even bother. I just leave them in the muffin pan and pop one out whenever i want it. 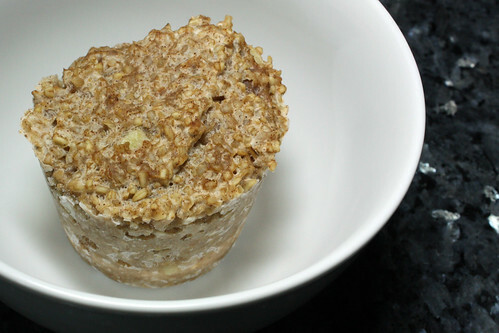 When you’re ready for breakfast, put a frozen block of oatmeal in a bowl. I used to follow the directions that Trader Joe’s provides on their packaging–heat for two minutes, smash up with a spoon, and heat for one to two minutes more–but when I was trying to make oatmeal cupcakes (I wasn’t joking about that), I learned that it’s easier just to cook them for four minutes on high, plus or minus 30 seconds depending on the power of your microwave. While the oatmeal does its thing in the microwave, I take those four minutes to get my fruit in order: slice up a mango, supreme an orange, chop an apple…whatever I have on hand. …and it looks just as good as the day you made it. 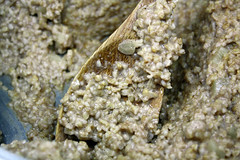 The dryness completely disappears, so you don’t have to worry about any rubbery bits mixed into the oatmeal like you might think there would be. So, not bad for a weekday morning breakfast, right? You have whole grains, fruit, dairy for protein, lots of vitamins and minerals, and a great-tasting, easy-to-eat meal that will fill you up and keep you going without feeling like a load of bricks in your stomach. I’ve been known to turn to is as an evening comfort food snack in front of the TV as well. 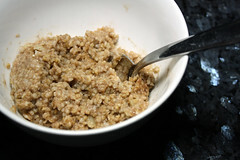 When I’m sick, it makes me feel warm and cozy, like someone has been slaving away over a pot of oatmeal just for me. Yeah, it didn’t seem like it would work! Even when I got the store-bought stuff, I assumed they made it differently so that it would freeze well, but fortunately that wasn’t the case. What a genius idea ! I must try it. That’s a great way to get oatmeal in the kids before school every morning. 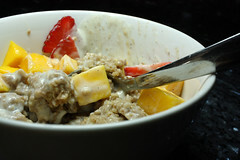 I hate those instant packets of sugar oatmeal, so I relegated oatmeal to weekend breakfast. I can’t wait to try it! Thanks!! Putting it in the fridge also works. I just put it in some tupperware and scoop some out– microwave- add toppings – done. It’s like any other leftover grain, really. This works best if eating it within 4 days. This idea has been so wonderful for me. I, for a long time have been wanting to include steel oats in my diet but sometimes I don’t have time to wash dishes. I like FAST AND EASY.